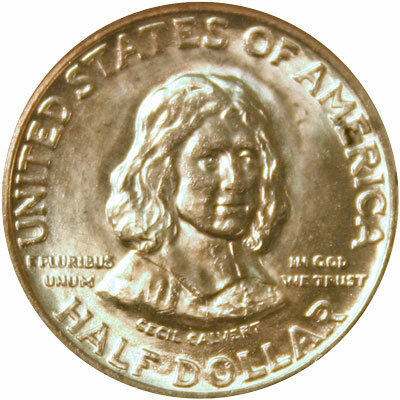 The Maryland Tercentenary Half Dollar Classic Commemorative Coin celebrated the 300th anniversary of the founding of the Maryland colony by Cecil Calvert, also known as Lord Baltimore. On May 9, 1934, the second session of the 73th Congress approved an act which became Public Law 73-215 "to authorize the coinage of 50-cent pieces in commemoration of the three-hundredth anniversary of the founding of the Province of Maryland." The law began, "That, in commemoration of the three-hundredth anniversary of the founding of the Province of Maryland, there shall be coined by the Director of the Mint twenty-five thousand silver 50-cent pieces of standard size, weight, and fineness and of a special appropriate design to be fixed by the Director of the Mint, with the approval of the Secretary of the Treasury, but the United States shall not be subject to the expense of making the models for master dies or other preparations for this coinage. "SEC. 2. That the coins herein authorized shall be issued at par and only upon the request of the chairman or secretary of the Maryland Tercentenary Commission. "SEC. 3. Such coins may be disposed of at par or at a premium by said Commission and all proceeds shall be used in furtherance of the Maryland Tercentenary Commission projects." The coin's estimated value ranges from $110 (low grade - XF) to $400 (high grade - MS-66). Extraordinary characteristics on the Maryland Tercentenary Half Dollar can command a price outside the estimated value range. The obverse or front of the coin bears the likeness of Cecil Calvert, Lord Baltimore. The coinage inscriptions say, United States of America, E Pluribus Unum, In God We Trust, Cecil Calvert, and Half Dollar. The reverse or back of the coin displays Calvert's coat of arms as part of the Great Seal of Maryland. 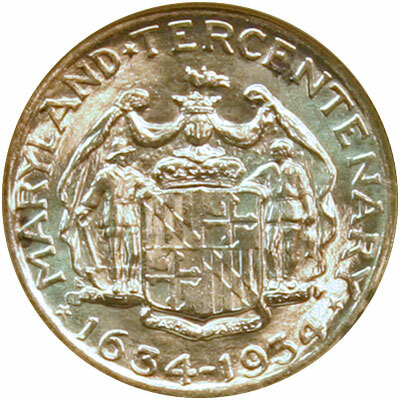 The coinage inscriptions read Maryland Tercentenary, Fatti Mascii Parole Femine, 1634-1934. Though the stated mintage limit was "twenty-five thousand," records show an additional 15 over the 25,000 limit were minted. "The reverse of the Great Seal of Maryland consists of an escutcheon, or shield, bearing the Calvert and Crossland arms quartered. Above is an earl's coronet and a full-faced helmet. The escutcheon is supported on one side by a farmer and on the other by a fisherman. It symbolizes Lord Baltimore's two estates: Maryland, and Avalon in Newfoundland." In addition, they explain that "Fatti Mascii Parole Femine" loosely translated means "manly deeds, womanly words." The preferred, more accurate, translation equates to "strong deeds, gentle words." Not shown on the coin, the seal also contains a Latin phrase from Psalm 5 which translates to "with favor wilt thou compass us as with a shield." In November 1633, Cecilius Calvert, the second Lord Baltimore, sent two ships, the Ark of Avalon and the Dove, with colonists to the area granted to his family by King Charles I. The colonists sailed from the Isle of Wight to a harbor "near where the river Potomac disembogues into the bay of Chesapeake." Cecilius Calvert's brother, Leonard, sailed to America to govern the land and the people while Cecilius stayed in England to protect the family's interests — at home and abroad. Not a word heard every day, "disembogue" means to discharge contents by pouring forth, for example, to discharge water, as at the mouth of a stream. Visit our GACS Numismatic Shoppe Maryland Tercentenary for a variety of useful items decorated with images of the classic commemorative silver half dollar coin.